Muggins is a domino game variant that is considered by many domino players to be one of the most fun ways to play the game. 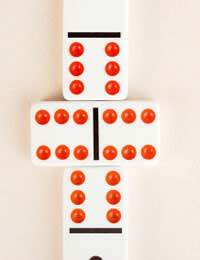 It is similar to many other kinds of domino games, such as Sniff, but the variation means that an added twist is featured. It is very similar to regular dominos, but where you would try to just get rid of all your dominos in these, in Muggins you have to be more tactical. The ultimate aim is to make the open ends of the domino layout on the table add up to five or a multiple of five. In order to play Muggins, it’s best to have between two and four players. The game uses the regular double six set of dominos, although some people will expand on this to include larger numbers of players. To begin, all the dominos are placed face down in the centre of the table and are shuffled. Each player picks one domino to see who draws the highest. This person will be the one who will be the lead player in the game and therefore the person who plays the first in game domino. If there are two players then they each draw seven tiles, three players each draw five tiles and four players each draw five tiles. The rest are left in the centre and are known generally as the stock tiles. Unlike most domino games, Muggins is started by playing any kind of domino you wish. There is no need to play a double, although should you choose to do so, this is also ok. When someone plays the first double at any stage in the game, it can be played off all four edges, highlighting the variant nature of Muggins in comparison to some other domino games. This domino is known as the spinner and it is the only double in the game where you can play off all four edges. The game proceeds much the same as regular draw dominos, where each player attempts to place a domino on an exposed end of the dominos on the table. If they are unable to play, they must choose a domino from the stock. If there are none left then sadly they miss a turn. The aim at all times is to make the open ends of the dominos add up to five or multiples of five as outlined above. The player who is able to do this will receive points to the value of the number they have made. The game is won on points and therefore it is important to always try to get to multiples of fives at the ends of the layout. These points are known as ‘Muggins points’ and should someone fail to record theirs, another player is able to steal them. They do so by yelling out ‘Muggins!’. In order to win the game of Muggins, you can get rid of all your dominos or the game may end due to there being no other possible ways to play the remaining dominos in each players hand. All players keep the points they accumulated during the game, but any dots left in their hand are counted. The player with the least points in his hand wins all of his opponents’ points. For example, if someone had only 2 points left in his hand, yet his opponents had 7, 10 and 3, all these points are added (minus the winning players 2 points). Then the points are rounded to the nearest five and the divided by five. This number is added to the winners total and most games are played to 100 points overall. Some games can be played to 200 or even 300 dependent on how long you wish to play.